Ziva is now 13 months old. Yes, it is now 1 year since we first met her - see those pictures... and just about 11 months since she came to her new home. She has made many friends, including her housemates: Ollie, Burt, Bumpy, and Missy. 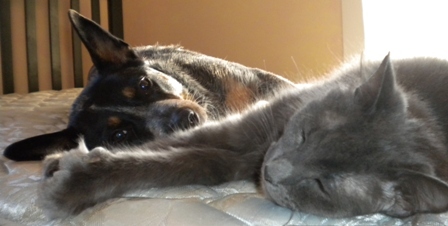 Her porchmates: Lt. Fuzz and Emily. Her friends about town - Tammy & Chester (e.g. cocker-spaniel) for those morning walks, Jill & the gang at Rosewood Flowers, Chris & Leonard at UFO, and many others. 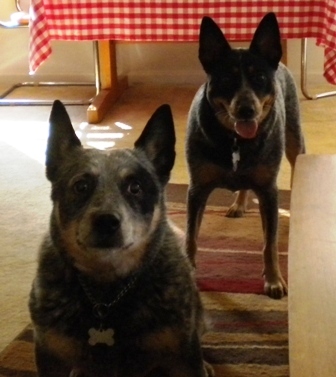 Ziva is really filling out into the famed Australian Blue Heeler "look". She loves to chase and retrieve stuff - problem is... she is still having trouble giving up the item consistently. She is a very protective and jealous girl. If any housemate is getting squoosies - guess who has to come up to make sure she doesn't miss out? Yep... not hard to guess. At the end of October, Ziva got to visit Auntie Janice - and Bertie. Bertie hosted Ziva for a couple of days. 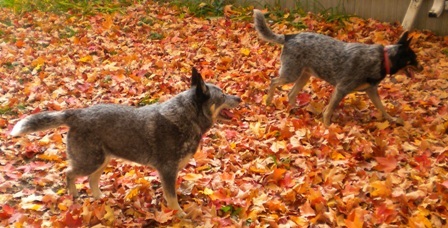 The following pics show what a 1 year old and a more mature Heeler look like together. On alert - waiting for hockey puck to drop! Notice that singular "alert" stance and gaze. Both are ready to react as soon as the ball, or in this case a hockey puck... moves. Shari picked up a "hamster in a ball" toy and we set it loose in the kitchen. Ziva was a bit baffled at first - so we gathered up the following short video... with some prodding - we got some activity from her. The video cast of characters: Ziva - doing her best to make us laugh, Ollie - whining for Turkey in the fridge - but he moves quickly when the hamster ball gets close, John doing his best to prod her along, and Shari with the background laughter. Not to let Ziva get all the credit for activity around here. Let's show you Burt, our tuxedo cat. Burt you see is the most "athletic" of all of our kitties, even though he won't jump on command, we find him in those "how'd you get there" places, all of the time. Previously, he climbed a 10 ft ladder and was just about ready to tight-rope the beams in our kitchen when we spotted him. 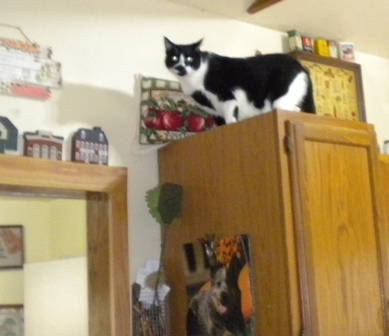 During this time of year, Shari changes the decorations on top of the cabinets - which means someone thinks, now that there is space, it's OK to be there. How'd you get up there... Burt? As we move into Winter around the Marsh, and of course the holiday season, everyone here thanks you for stopping by.